As the days, and weeks and months of motherhood whip by, my confidence in parenting continues to gain momentum: from being a complete rookie, to successfully (kudos to me and Borys) raising an (almost) 10 month old. 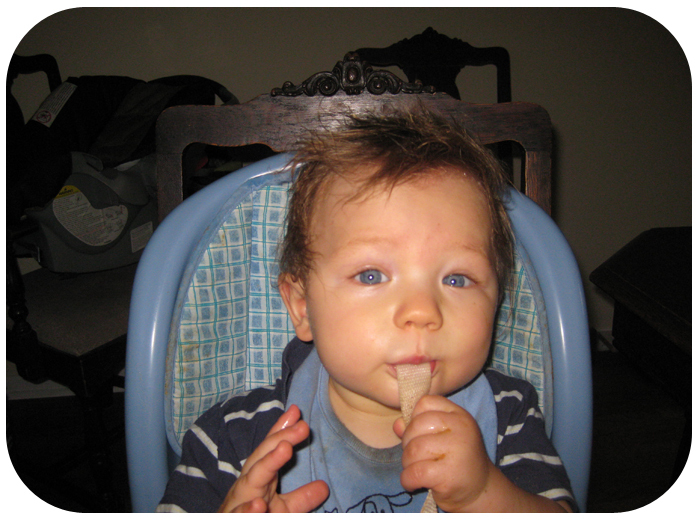 One, among many, major factors in parenting is feeding. First it’s: Will I breastfeed or formula feed? Then it’s: Will I make my own baby food or buy store bought? And I suppose food related questions will continue to persist from here on in. I mean there’s always things to learn and people willing to lend their two cents of advice. One thing I’ve noticed (and enjoyed) over the past few months is that feeding time has gotten progressively less messy: that was until today. 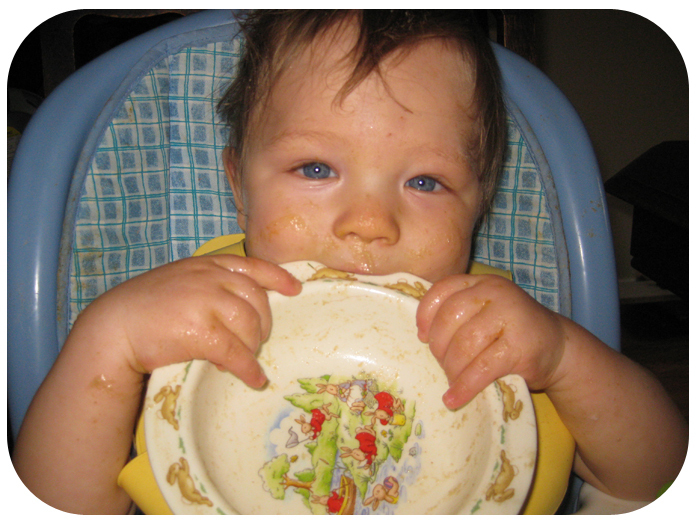 I mean I used to deal with slippery hands and a messy floor on a daily basis, especially when Niko first started eating solids. One of his favourite tricks used to be getting a handful of cereal and then itching his face with his palm, all the while rubbing the mess onto his face, neck hair, you name it. Tonite I saw the ghosts of feeding past come back to life. 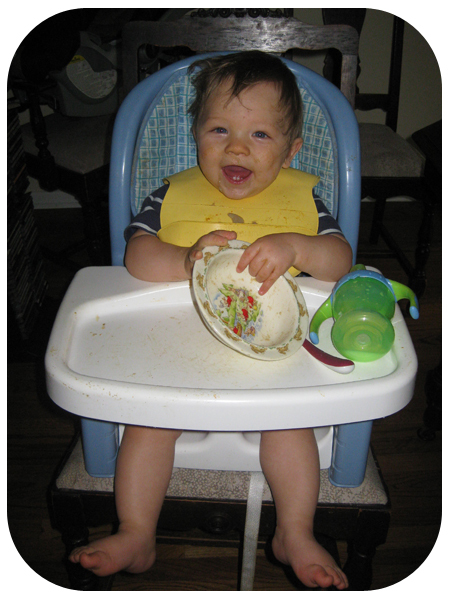 Niko made a huge mess with his dinner! If there was a running commentary for dinner time it could have gone something like this: “Hello cereal face mask. And oh, how I missed you cereal hair gel. And why not throw all my utensils and my bowl on the floor as well? I mean let’s just make a huge production of it!” But why not, really? I guess we’re all entitiled to periods of regression, and Niko’s no exception. Although, I have to admit, there is something alluring and perhaps even liberating about getting a handful of cereal and doing what you want with it. So in that light: Go Niko Go! But let’s just do it when it’s Daddy’s watch, next time. 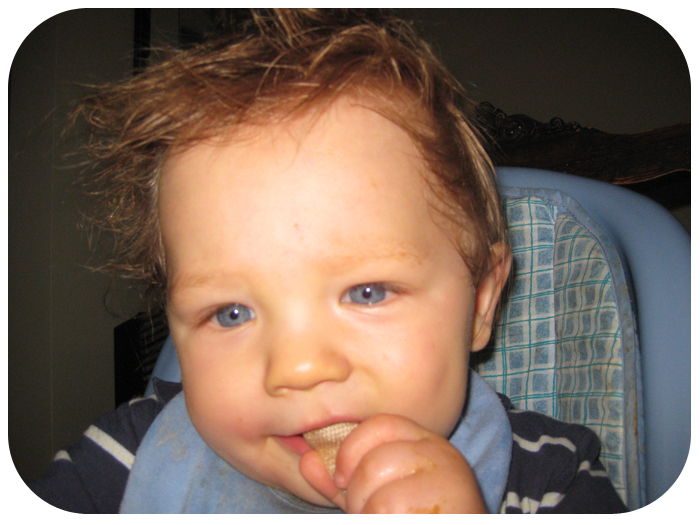 Note: Niko’s hairstyle below, is 100% courtesy of the styling aids of baby cereal and his own hands. Contact me, if you’d like an appointment. 1 Response to "Babies Thrive on a Mess, I Guess"